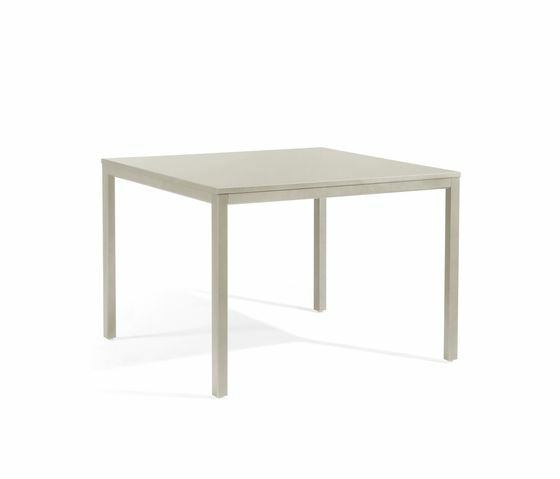 Manutti offers a wide range of tables which you can combine with your chairs as you wish. For table tops we offer a choice of blue stone, teak, granite, Silestone®, Trespa® or glass. Beautiful effects can be created if you choose a frame of teak combined with inserts of bluestone, teak, granite... The frames are available in stainless steel, aluminum, teak or wrought iron. The custom-made pieces we can produce for you offer infinite potential in finish and style.